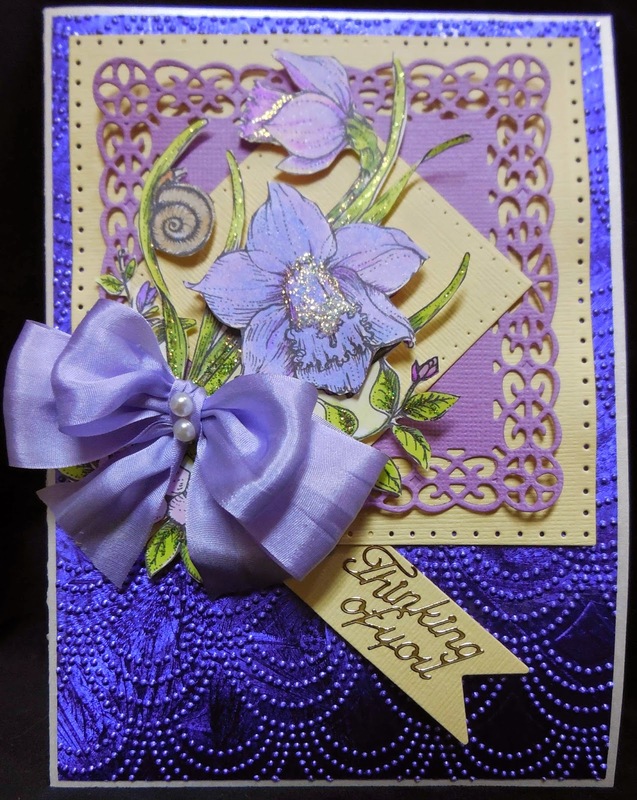 I made this card for the challenge at Power Poppy and for my friend who has been in the hospital for months. I used Dancing with Daffodils digital image from Power Poppy and printed it on text cryogen white paper. I colored them copic markers and fancy cut them out. I used the center flower from another of the images and layered it over the bouquet. The die cuts are from Sue Wilson's collection of New York Herald Square and got those from Joan's Garden. I used my Sutter bow maker and added some pearls to the center and the tag is a spellbinders. The background is also from Sue Wilson and it's the beaded fanfare which Joan's Garden can order for you as well. Karen this beautiful! Your friend is sure to smile and help lift their spirits. Your cutting is fabulous on the daffodils. Beautiful die cut frame and great ribbon bow! Thanks for playing in the Cut it Out Challenge this month! BEAUTIFUL card, Karen!! I love the bouquet and the big flower in the middle. Your colors are beautiful together. Your friend will love it. Hope they get better soon and can go home!!! Gorgeous, Karen! That's an amazing background, a beautiful bow, and absolutely lovely daffodils. Your friend will appreciate this. That sure is a long time to be in the hospital. I hope she's well soon. Thank you for joining our challenge at Power Poppy! What an elegant job with these in purples! Beautifully done Karen...I love the pretty silk bow too!